A very interesting defeated Spanish House of Bourbon, becomes British infantry officer's sword, in good condition. You really will not find many if any more of these! 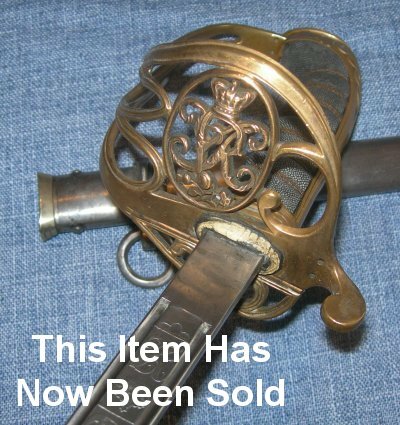 An 1866 Toledo blade with Queen Isabella II's royal cypher on it, attached to an 1822/45 pattern British infantry officer's hilt! Clearly, this was the property of a Spanish officer loyal to Queen Isabella II, who felt forced or obliged to flee to England after the fall of the Spanish House of Bourbon / Queen Isabella's exile in 1868. The 32 1/2 inch blade is in very good condition except it has been broken in half and then period repaired. I suspect the blade was broken as part of the defeat and surrender by Queen Isabella's loyalists at the Battle of Alcolea. The blade has been very well repaired, which means it was done at the time. The break also corresponds with the lower suspension mount of the scabbard, as if to give it extra strength. The scabbard clearly is British made, so was made for the repaired blade. Another thing that is unusual about this sword is the fact it has the 1822/1845 pattern hilt, with the folding guard, not the later 1854 rigid guard as it perhaps ought to. I can only believe this was a personal preference of the officer who was allowed to have his slight breaks from convention and regulation pattern. It is very unusual to see the Royal Cypher of Queen Isabella II on the blade below the royal cypher of Queen Victoria to the hilt. In any event, this is a lovely as much as unusual sword. The blade is firm in the hilt. The hilt retains some gilt. The fishskin grip is mostly good, two small areas of loss / wear through. The twisted grip wire bindings are good. The sword sheathes and draws well from / into the bespoke steel scabbard. A very unique item and well worth the price. Further / large images available upon request. The item reference number is A03 (428).